BioCubaFarma, the Cuban organization of Biotechnology and Pharmaceutical Industries, manages the country’s efforts toward manufacturing medicines, diagnostics and medical equipment and providing high quality life science services to improve people’s health. BioCubaFarma serves as a gateway for potential partners and investors interested in accessing the extensive biopharma resources Cuba has to offer. BioCubaFarma, the Cuban organization of Biotechnology and Pharmaceutical Industries, is a holding company that manages and coordinates national efforts in the biopharma sector to produce medicines and medical equipment and to provide high-quality life science services of high economic and social impact. The biotechnology and pharma­ceutical industry is one of Cuba’s strategic industries, supplying goods, technologies, and services that comply with the high international quality standards in the sector. Building on Cuba’s homegrown scientific and technical expertise and the government’s substantial support for and investment in biotechnological and pharmaceutical research and development (R&D), BioCubaFarma has brought together the many assets that make Cuba’s biotechnology and pharmaceutical industry a world-class player. In keeping with its mission to prioritize pub­lic health and the National Health System, BioCubaFarma has consolidated a deep product pipeline that includes prophylactic and therapeutic vaccines, innovative biopharmaceutical products for cancer, cardiovascular disease (CVD), neurology, and other indications, biosimilar products, generic drugs, diagnostic reagents, medical equipment, agrobio­tech products, and natural and traditional medicines. BioCubaFarma manages a large portfolio of pat­ented inventions, with 2438 patents registered out­side Cuba and more than 2640 patent registration applications pending worldwide. This catalog of assets provides the basis for an open and very flex­ible approach to collaboration with external partners through mechanisms that range from research col­laboration agreements to licensing and codevelop­ments agreements. BioCubaFarma is also seeking potential partners interested in investing in Cuban biopharma assets through venture funding or similar mechanisms. “Cuba bet on biotechnology very early, opening the first research–manufacturing facility in the country in 1981,” said Agustín Lage, founder of and until recently also director of BioCubaFarma’s Center of Molecular Immunology. “Those early steps set the stage for the sector’s current performance in Cuba—supplying over 60% of the country’s essential medicines list, exporting to more than 40 countries, registering innovative products, showing tangible impact in public health, and owning more than 2000 patent filings worldwide. This provides the backdrop for further growth of the biopharma sector in Cuba over the next decade.” Lage currently serves as scientific advisor to BioCubaFarma. BioCubaFarma’s strength and value derive from a network of 34 companies and institutions under one umbrella that collaborate on maximizing the impact of their R&D programs in the biotechnological and pharmaceutical space. Eight institutions constitute the core of this network. The Center of Genetic Engineering and Biotechnology (CIGB): the CIGB focuses on the research, development, manufacture and commercialization of human and veterinary vaccines, and therapeutic molecules such as peptides, proteins, monoclonal antibodies, diagnostic systems, genetically improved plants, functional foods, and aquaculture products. The Center of Molecular Immunology (CIM): the CIM specializes in the development and manufacture of products for the diagnosis and treatment of diseases related to the immune system, and of molecular vaccines for cancer immunotherapy. The Finlay Institute (IFV): the IFV is Cuba’s pre-eminent vaccine research and production center. The institute coordinates research in immunology, molecular biology, and applied microbiology to develop novel vaccines and the fermentation processes needed for their production. Among IFV’s top accomplishments is the development of the first vaccine in the world against meningitis B almost 30 years ago. The Center of Immunoassay (CIE): the CIE is devoted to the development, manufacture, and commercialization of the SUMA platform, an ultramicro analytical system designed for large public health programs that require neonatal screening, blood certification, epidemiological surveillance, and cancer control. The CIE also commercializes glucometers and capillary glucose biosensors. The Neurosciences Center (CNEURO): the CNEURO develops and markets technologies and services for mental health professionals—including neurologists, neurosurgeons, neurophysiologists, psychiatrists, psychologists, and intensive care physicians—who need tools to evaluate factors such as brain or muscular electrical activity (spontaneous or evoked) or hearing impairment. The National Center for Scientific Research (CNIC): the CNIC focuses on the development and manufacture of pharmaceutical products and supplemental foods derived from natural products such as sugar cane and beeswax. The Central Institute for Digital Research (ICID): the ICID develops, manufactures, and commercializes medical and digital technology devices under the trademark COMBIOMED for the diagnosis and monitoring of CVD and other conditions. FARMACUBA: FARMACUBA manages the export of generic drugs, blood-derived products, and human placenta-derived products, and the import of raw materials, packaging materials, pharmaceuticals, reagents, equipment, and spare parts for the Cuban pharmaceutical and biotechnological industry. Each of these institutions is organized following the principle of a ‘closed cycle’ enterprise that fully integrates all steps of translation—from research to post-marketing follow-up—to ensure the stream­lined progress of any R&D program. The Havana-based CIGB, founded in 1986, is the lead­ing center for biotechnology research in Cuba. With a workforce of more than 1,500, the center is one of the pre-eminent biotechnology organizations in Latin America and one of the top exporters of Cuban health and food technology to the rest of the world (Fig. 1). The CIGB is organized along a number of director­ates that seamlessly integrate the complete innovation cycle—from basic research to commercialization. The Biomedical Research Directorate comprises several departments, including vaccines, phar­maceuticals, immuno-diagnosis and genomics, chemical physics, and systems biology. Within these departments, the CIGB conducts research aimed at the development of biomedical products for preven­tion and treatment in more than 20 therapeutic areas, including infectious diseases, cardiovascular, neurode­generative, cancer, inflammation, and autoimmunity. The Agricultural Biotechnology Directorate conducts research in plant and animal biotechnol­ogy—mainly veterinary vaccines and aquaculture, plant improvement through genetic engineering, bioproducts for agriculture, and functional foods. The Technological Development Directorate man­ages the translational aspects of turning scientific results into actual products and/or technologies. This process includes ensuring the adoption and implementation of good laboratory practices (GLP) and GMP to comply with the highest standards of quality in preclinical and clinical research, and during process development and optimization of laboratory and pilot-scale batch production. The Clinical Trials Directorate coordinates the design and execution of clinical studies and all post-marketing pharmacosurveillance activities. The direc­torate works closely, and starting at the early stages of development of a new product, with the other CIGB departments on clinical trial authorizations and the preparation of registration packages for the regula­tory authorities in Cuba and other countries. In addition to the R&D directorates, the CIGB fea­tures a business development unit that oversees and coordinates all aspects of identifying, negotiating and managing national and international collaborative projects. Its mission is key to determining R&D strategies in the early stages of any CIGB project to ensure their success in the highly regulated global environment. Cardiovascular disease (CVD) remains the number one cause of death globally. Coronary heart disease, which often leads to heart attack, is the top manifestation of CVD. Heart attacks can be treated with a number of drugs, including blood thinners such as aspirin and heparin, and vasodilators such as nitroglycerin, thrombolytics, antiplatelet agents, beta blockers, and angiotensin-converting enzyme inhibitors. Researchers at the CIGB are developing an alterna­tive approach that involves harnessing the cytopro­tective capabilities of growth hormone-releasing peptide 6 (GHRP6), a six-amino-acid peptide that targets specific G protein-coupled receptors in the hypothalamus and the pituitary gland and CD36, a membrane receptor implicated in CVD. Preclinical experiments with CIGB 500, a synthetic version of the peptide developed at the CIGB, have shown that the peptide decreases myocardial necrosis caused by acute infarction by reducing oxidative cellular stress and apoptosis. Fig. 2 | A new approach to fighting cardiovascular disease. Researchers at the CIGB have developed CIGB 500, a synthetic version of growth hormone-releasing peptide 6 (GHRP6) that helps mitigate myocardial necrosis. Panels show a, AMI treated with saline. b, AMI treated with CIGB 500. c, Evidence shows necrosis and heart failure are still present. d, Evidence shows reduced levels of necrosis, heart failure and other toxic systemic complications. AMI, acute myocardial infarction. In vitro, CIGB 500 has been shown to have anti-apoptotic and antinecrotic effects in cardiac and pericardial tissue. 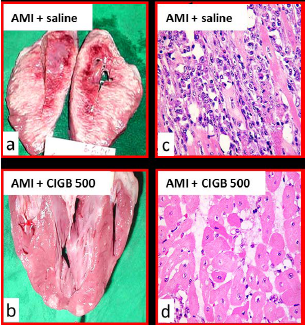 In vivo, in a surgically induced porcine model of acute myocardial infarction and in a doxorubicin-induced rat model of dilated car­diomyopathy, treatment with CIGB 500 resulted in reduced levels of necrosis, heart failure and other toxic systemic complications (Fig. 2). The mechanism of action of CIGB 500 represents a combination of inotropic, antifibrotic, anti-inflammatory, cytoprotec­tive, cardioprotective, and vasodilatory effects. In a phase 1 dose-escalation clinical study, CIGB 500 met all safety and tolerability endpoints, and in a phase 1b study in patients with acute myocardial infarction, CIGB also met all safety endpoints. CIGB 500 has been awarded patents in Cuba, Europe, the US, Turkey, Russia, and China. The CIGB is seeking to out-license CIGB 500 and to establish codevelop­ment and commercialization partnerships with interested companies across the globe. BioCubaFarma centralizes the country’s efforts to open up the Cuban biotechnological and pharmaceu­tical industry and research infrastructure to the world. In addition to its national network, BioCubaFarma has an extensive global presence through mixed capital companies in China, Spain, Thailand, and Singapore, solely Cuban-owned companies in Venezuela, Ecuador, Brazil, and Mexico, a representative office in China, and a branch office in Colombia. BioCubaFarma offers many new business oppor­tunities to potential partners, including scientific agreements, supporting the R&D of new biopharma­ceutical products and broader alliances with overseas companies to clinically develop and commercialize therapeutic, diagnostic, and medical technology products. BioCubaFarma is also seeking to attract foreign venture capital and to establish joint ventures to develop innovative products. The types of partnership can include license agree­ments, project codevelopment agreements, incorpo­rated joint venture companies, representation and supply agreements, incorporated subsidiaries, tech­nology transfer agreements, contract manufacturing, and foreign investments on Cuban soil. BIOCUBAFARMA is a business organization that produces high technology medicines, equipment and services aimed at the improvement of human health, the generation of exportable goods and services and the production of food with advanced technologies. With more than 21,600 workers as human capital, hundreds of specialists of high professional level integrated to the research-production and 62 production facilities; It represents a strategic industry, with high standards of its products and services and a solid international positioning.